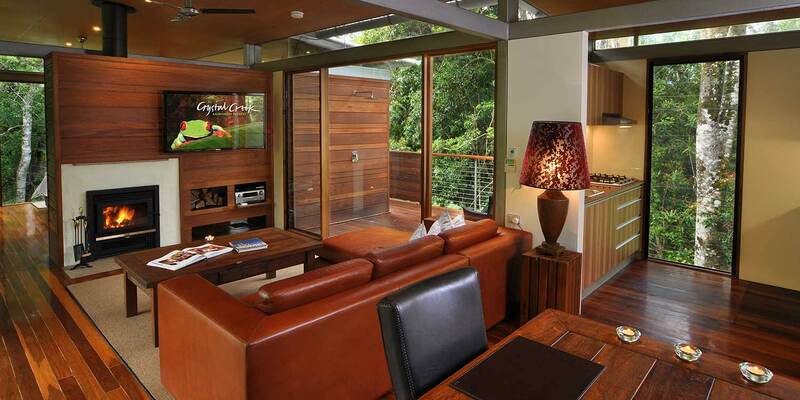 Romantic escapes from Sydney and Brisbane. 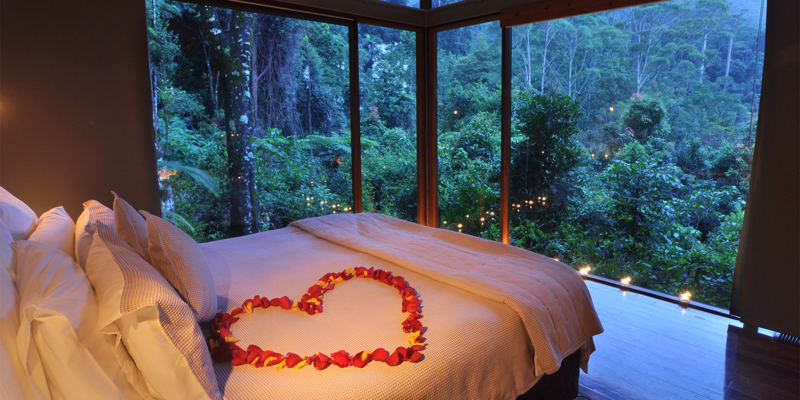 Private and secluded self contained luxury rainforest accommodation for a couples only romantic getaway at Crystal Creek Rainforest Retreat. 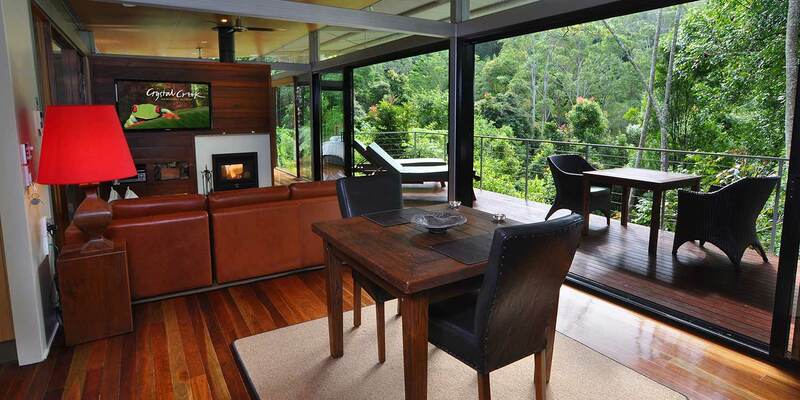 This spacious, airy, open-plan accommodation is almost totally enclosed in glass, allowing uninterrupted views of the tranquil rainforest. Each secluded bungalow has floor-to-ceiling windows and incredible rainforest vistas even in the kitchen and walk-in shower. Top-of-the-range TV and DVD/Blu-ray/CD in the living area and bedroom are complemented with a surround sound system piped throughout. A double-sided fireplace provides luxurious warmth for both the living area and the bedroom. 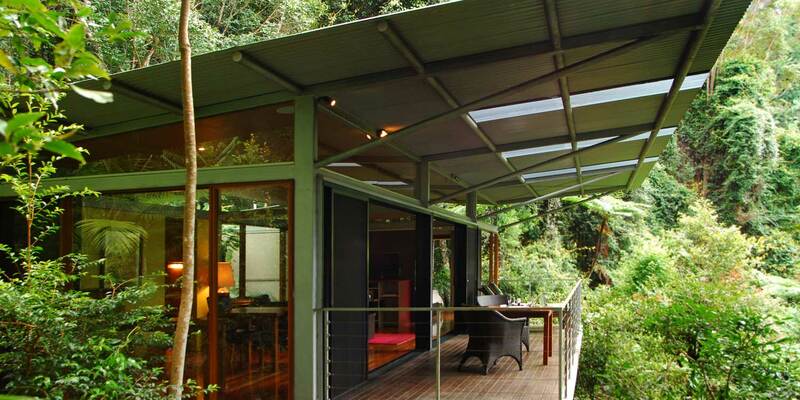 Sliding glass doors open to a large covered deck allowing inside and outside to become one. 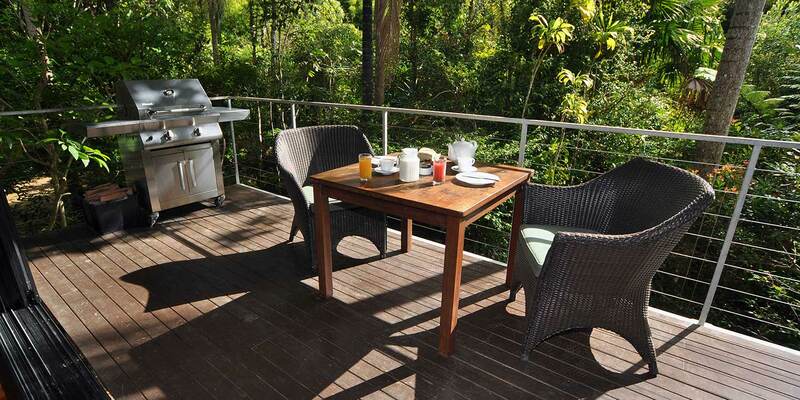 With expansive old-growth rainforest and captivating mountain views, prepare your favourite barbecue meal, sit back, relax and enjoy the remarkable serenity of the rainforest. The generous galley-style kitchens have dishwashers and granite benchtops. Marble bathrooms with sunken double spa baths lead to a private deck featuring an outdoor shower. 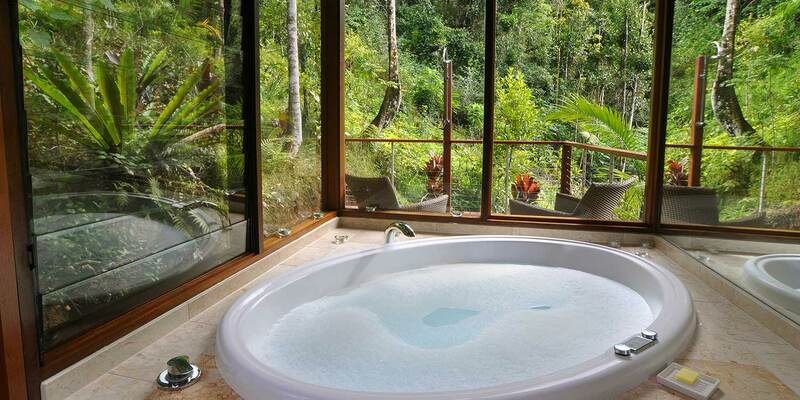 You and your partner can shower completely au naturel with the rainforest surrounding you – but in complete privacy. Our two Glass Terrace Bungalows, Satinash and Pandorea, each accommodate one couple only, perfect for a romantic escape from Sydney or Brisbane. 2x Delicious Dinners for 2 people. 3 nights’ accommodation: 2 nights midweek + 1 night weekend. 27 October 2015We absolutely loved our time spent here. Such a beautiful, quiet place. The hike up to the lookout was a challenge, but so nice to relax back on the deck lounge chairs after with a glass of wine. We will be back! 24 March 2016The perfect place to kick back and relax. Waking up to the sound of the creek and view of the forest was sublime. We will be back, and we will miss the glow worms. 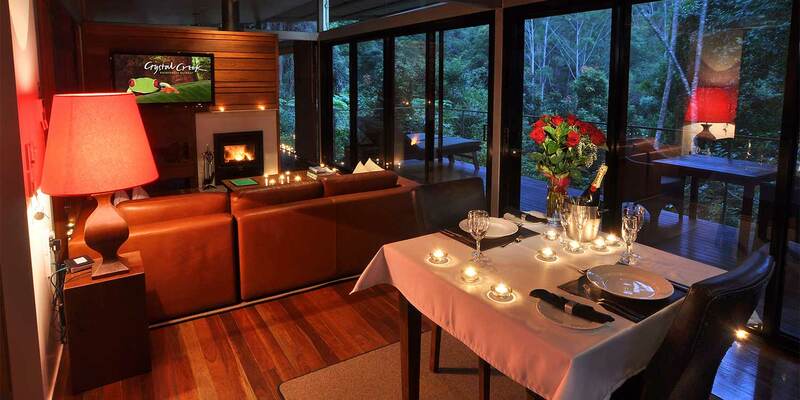 26 May 2015We went to Crystal Creek Rainforest Retreat to celebrate our anniversary. This place is amazing. We stayed in a Glass Terrace Bungalow. We found it to be private, quiet and peaceful. 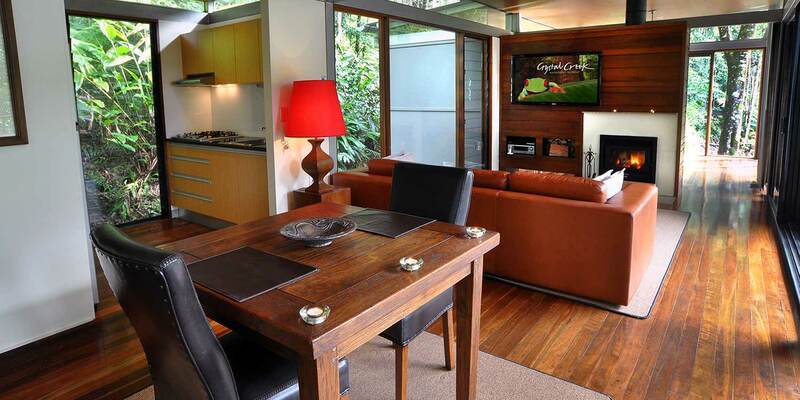 This is the perfect location for a peaceful, relaxing weekend away. 22 September 2017We staying a few weeks ago for 5 nights for our honey, and it was the most relaxed we have ever felt. After the craziness a wedding could bring and also having a child ourselves, it was nice to go to a beautiful place like Crystal Creek to unwind and rejuvenate! We stayed in Satinash and it was so beautiful! Being amongst all that natural beauty was magical! Thankyou for an amazing stay, we will definitely be back again!! 9 September 2015We thoroughly enjoyed our perfect 3 days and plan to come back next year for our 40th Wedding Anniversary. 17 April 2016Such a beautiful, relaxing location! We had an amazing time and wish we could stay longer. Gorgeous accommodation and amazing rainforest, loved every minute. 29 November 2016Thank you for providing such a breathtaking experience, the scenery is a wonderful backdrop to the relaxing and timeless surrounds we were lucky enough to be immersed in. We will definitely recommend Crystal Creek to friends and family. 5 December 2015Exactly what we needed, peace and quiet. Satinash Bungalow was perfect. Bushwalk and a swim were lovely, fireplace and sitting on the balcony listening to nothing but the birds, we will definitely be back. 29 March 2015Could not have found a more romantic, tranquil place to spend our 10th wedding anniversary. Thank you for sharing this amazing part of the world. The food was nothing short of amazing! We will be back. 3 June 2017We had the pleasure of a 3 night honeymoon package. There is not one thing that they could do better. Everything was catered for perfectly (I.e. Spa products, firewood, chocolate, coffee, candles etc.) The food is magnificent and there’s a lot of it. The cabin itself is just beautiful. We stayed in Satinash. The spa, fireplace and outdoor shower is such a pleasure. You’re in complete privacy. We saw 2 people in 3 days – that was only because we went out for a walk. 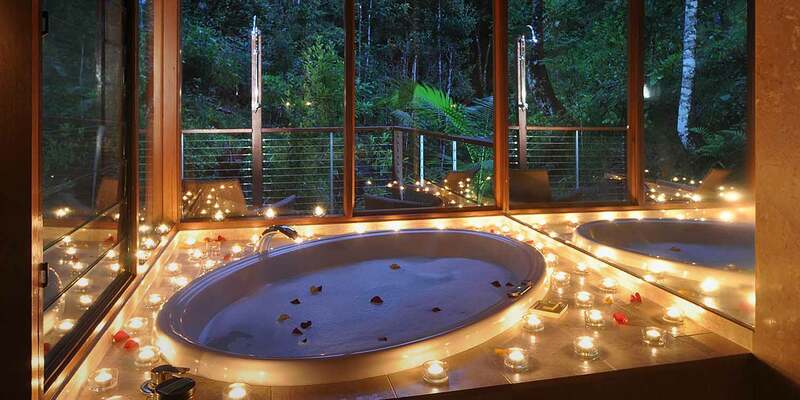 It was the perfect get away and romance overload! I will definitely be going back. Thanks for a wonderful stay. 1 March 2016What a beautiful location you have, the Glass Terrace Bungalow was fantastic, just what we envisaged. We loved every minute… and guess what? We got engaged!! Thanks for making the weekend the best it could possibly be. 12 June 2016We had an amazing time and got engaged. So happy and thankful for everything. It is so beautiful here and we have loved every minute of it. 29 June 2018Not sure what we can say that hasn’t already been said in other rave reviews. This place is absolutely spectacular in every way. We’ve stayed on two occasions, firstly in the Mountain View and then in the Glass Terrace. Just gorgeous! Private, romantic, and very picturesque. Food packages are glorious too. Just perfect.